Telstar 14 was launched 11 Jan 2004 using a ZENIT 3SL rocket from a sea platform. The Odyssey Launch Platform was on the equator to minimise the fuel load required to reach geostationary orbit over the equator at 63 deg west longitude. The satellite capability offer customers unique coverage patterns in Brazil and Latin America and will be the first Brazilian operator to offer its own Ku-band service to Brazil. The spacecraft is equipped with 51 Ku-band transponders serving North America, the Central American countries, the Caribbean and the North Atlantic Ocean. The North Atlantic beam is suitable for Internet-to-aircraft services. 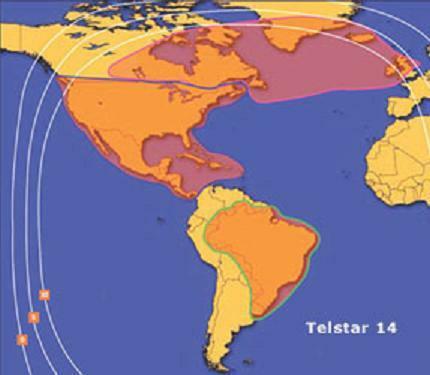 Telstar 14 / Estrela do Sul 1 has an expected lifetime of at least 15 years. The North America beam is used by Skycasters for high end satellite internet services to small VSAT terminals in the coverage are shown. Back link: Skycasters satellite broadband internet services in the North America and the Caribbean area.